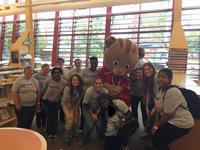 Daniel Tiger joins Words at Play staff and volunteers to celebrate a successful Block Party. 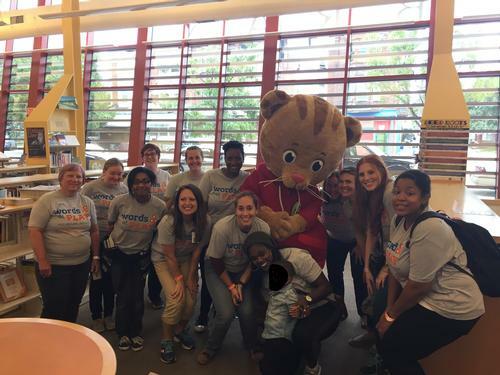 The PNC Words at Play Vocabulary Initiative kicked off the fall season with a Block Party at Widener Library this past weekend, where we were joined by Daniel Tiger from WHYY to greet a few hundred friends and neighbors. The theme of the day was "family," and Words at Play partners led activities highlighting how their organizations related to families. Families took home free books – The Feel Good Book by Todd Parr, Niño Wrestles the Word by Yuyi Morales, and MORE MORE MORE, Said the Baby by Vera B. Williams. Block Party participants were also treated to food from Pitruco Pizza, Siddiq’s Real Fruit Water Ice, The Tot Cart, and Sweet Box. Words at Play thanks the community partners who came out to make this day special for our families – everybody had a great time celebrating vocabulary and families! The next Words at Play event is the October Play Party Series held at Widener Library on the first four Saturdays in October from 11:00 a.m. - 12:00 p.m. The theme for the month is "food" and we hope to see you for some delicious vocabulary-building fun! To learn about more upcoming events and to see what Words at Play is up to, subscribe to our newsletter!